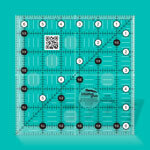 Creative Grids® rulers are designed by quilters for quilters. They offer the complete package: a quality product, pattern and book support, and education. Their trademark grip and accurate markings are why they are the top ruler manufacturer in the industry. Top designers feature their rulers and templates in their books and patterns. And they offer video tutorials for every product. With over 100 rulers, Creative Grids® has the tool you need to successfully complete your next project.